SpaceX’s Dragon: The Dawn of a New Age for Space Exploration? 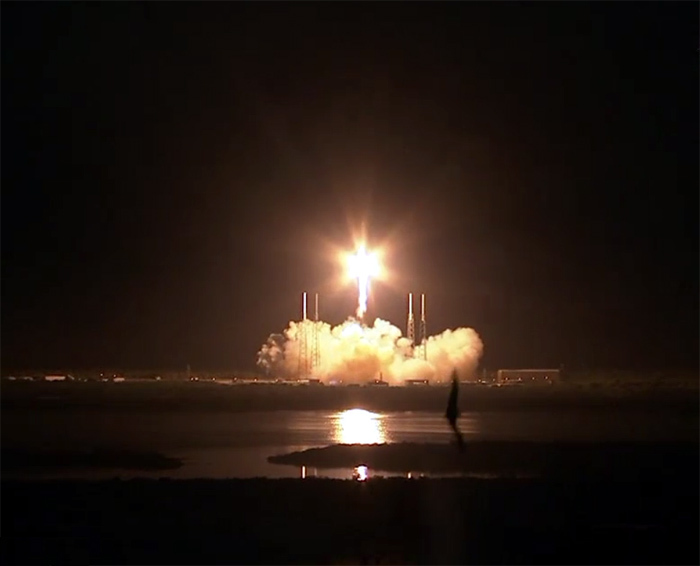 This morning, at 12:44 a.m. PDT, a rocket was launched from Cape Canaveral Air Force Station Space Launch Complex 40. It wasn’t the biggest of rockets; it wasn’t carrying a particularly exciting payload, either. But it may well represent a crossroads in spaceflight history. Space Exploration Technologies, or SpaceX, saw a perfect launch of its Falcon 9 rocket. Sporting nine Merlin engines — engines designed and built in-house — the rocket blasted off exactly as planned even though the first launch attempt on Saturday was scrubbed. The “failed” attempt — that was aborted automatically in the last second due to a faulty valve in number 5 engine — was actually a success unto itself; a means of ensuring the launch abort systems were working as they should. But Saturday is a distant memory as, at right at this moment, there’s an unmanned spacecraft chasing after the International Space Station set for a historic orbital rendezvous in three days time. The Falcon 9 operated as it should and so has the Dragon capsule. So far. Assuming everything else goes to plan, what does this mission mean for the future of spaceflight? This is no silver bullet to solve all our spaceflight woes, but it could be the start of something a little bit special. Elon Musk, Internet entrepraneur and SpaceX CEO, has no qualms about thinking big. His enthusiasm for space exploration is infectious and his eye for applying a business model to rocket science is, so far, genius. In a world driven by politics and money, he’s found a way of tying the two together to give the noble effort of pushing mankind’s frontiers an accelerated start. He’s eying Mars. If SpaceX can build rockets and spaceships, perhaps companies, governments and institutions will buy his company’s services to travel through interplanetary space. Does this mean Mars “taxi rides” are in our future? Perhaps. But spaceflight history is littered with failed start-ups, accidents and expense, so time will only tell how far SpaceX and other private spaceflight companies can push mankind’s exploration envelope. I can’t help but be enthusiastic for Musk’s endeavour, however. Remember Sept. 28, 2008, when SpaceX became the first company to launch its own rocket into orbit? That was only four short years ago. It may be too early to get excited over seeing the Dragon docked to the ISS, but the importance of such an event shouldn’t be ignored. Once SpaceX proves it can be done, this could be a paradigm shift. Space exploration could be driven by enterprise and exploration, potentially transforming us into a multi-planetary species. Listen to the “Which Way, LA” show hosted by Warren Olney where we discuss SpaceX and commercial space. Next Next post: Venus Transit: Streamed LIVE from Mt. Wilson, California!